Last minute update: I’ve been remiss in sharing this news! Tonight, at the State Library of South Australia, I will be participating in a ‘Tangent’ panel with the State Theatre Company’s Artistic Director Geordie Brookman, Little Bird playwright Nicki Bloom, SA artist Julia Robinson for an evening exploring myths and fairytales, and the challenges of bringing those stories to life through art. This Tangent session accompanies the State Theatre Company’s new production, Little Bird: “A dark fairytale for grown-ups, a song cycle, a thrilling piece of solo performance, Little Bird is a gripping story of how people can transform many times over the course of a lifetime. All sessions are $5 and bookings are essential: Click here to book. 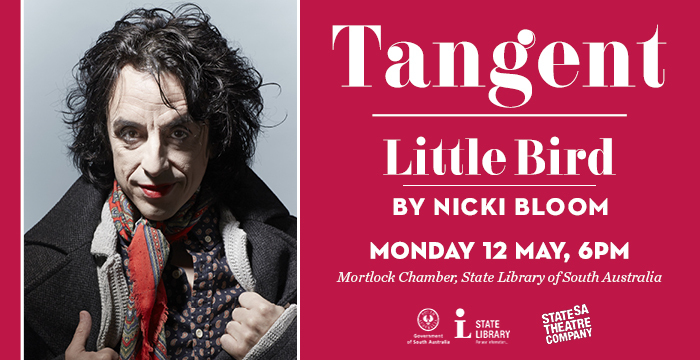 Tags: fairy tales, geordie brookman, julia robinson, mortlock, myth, nicki bloom, state library of south australia, state theatre company. Bookmark the permalink. Previous post ← POSTSCRIPTS #32/33 & #34/35: Two volumes, two stories!